The following is a guest post last week’s Guest Presenter & Facebook Marketing Ninja, Mike Mueller. You can access the webinar replay here and don’t forget, we have another free webinar coming up June 10th at 10:00am with Stacey Harmon – Register Now! Just a quick recap of some of the most important items in the webinar… There are three different entities within Facebook and they don’t do a very good job explaining them. Everyone has a Profile – you only get one. You always sign in with it. People who want to connect to it ask to become friends. Profiles have a Wall, Info and Photo Tab. 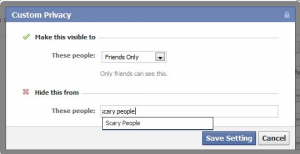 You have a limit of 5,000 “friends” and Page LIKEs that can be connected to a profile. It’s actually a violation of the T.O.S. to publish anything of commercial value on your wall. A Business Page or Fan Page or LIKE Page are all the same. Just like the Profile the Page has a Wall, Info and Photo Tabs. You don’t have to ask to be a friend to connect – you just LIKE the page. There is no limit to the number of LIKES. Quite the opposite when it comes to the T.O.S. For Pages – they encourage you to publish commercial content on the wall. Pages also automatically create a level of privacy between the owners and the LIKErs. We don’t know who is running a Page example: http://www.facebook.com/cocacola has 47+ people working it behind the scenes. You can also denote that you are the person behind the page, it’s up to you. The six choices all create a page with different categories. All the Categories do is create different boxes available on your info tab. FB does not get Real Estate. If they did, the Local Business > Real Estate page would have info tab boxes for “Hours of Operation” and “Valet Parking?” – seriously! I suggest the “Brand or Product” and “website” for a starting point. You can always change categories later. Facebook groups can be secret or public. You connect to a group by becoming a “Member” of the group. What happens in a group does not become viral – it stays within that group. Only members of that group can participate. HINT: If you confused as to what type of entity you are dealing with on FB – just ask yourself how you connect to it? Are you a Friend, a LIKE, or a MEMBER? LISTS are the golden ticket to better work habits in Facebook. Start here: https://www.facebook.com/friends/edit/ Create lists and put your friends in the lists as they fit. Once you have people in lists you can now go over and change the privacy settings for those lists. At the bottom of this page https://www.facebook.com/settings/?tab=privacy you’ll see “customize settings”. Click that. In each section you’ll have the ability to set a custom setting that either allows or hides the items from a specific person or a LIST. I suggest that if you are adding your clients as friends you put them in a list. If you have embarrassing friends – you also put them in their own list. This way you can keep the two from ever meeting. When you first login to Facebook – they’ll take you to what they call the News Feed. There’s two options, the default is “Top News” – it should be renamed Popularity Contest. It’s FB’s attempt to deliver to you the most important items in your sphere. It’s not in chronological order. It’s based on what is called EdgeRank. We’re not going there – it’s a whole other webinar worth. There’s a drop down to the right of it (once you are on it). That drop down will allow you to see an “as it happens” feed for any of your Lists. HINT: Remember how I mentioned you should put all your clients in a list? Who’s the most apt to refer a friend, family member or coworker to you? That’s right, it’s them! Now you have the ability to see what’s new in their world quickly and easily. When you are on the List you want – do a CTRL D (bookmark) and that should be the first thing you check in FB when you login. Touch base with a quick “That’s a great picture!” and you’ll stay top of mind! When you close that next deal – you owe me a beer. I think every agent should have a page and maybe even a few! Here’s 6 reasons. Pages are indexed by Google. That means a Page might turn up in a Google Search before your website does. Privacy. As consumers, we know we have a certain amount of privacy when we LIKE a page. We’re not going to be sharing last weeks BBQ pictures with Facebook.com/COKE just because we liked the page. For your next client (the one you haven’t met yet) it may be a little creepy for them to reach out and want to be friends with the neighborhood agent. For them, liking a page is easy. That TOS thing. Although there are few Agents being kicked off of FB for violating the Profile TOS, and everybody is doing it – do you really want to risk it? Vanity URL– a page can get a vanity URL like Facbook.com/COKE and there can only be one. If I was farming a neighborhood like “Sunny Acres” – I would setup a lifestyle page like “Living the Sunny Acres Lifestyle” and once I had 25 LIKES I could get Facebook.com/SunnyAcres. I could put that on my biz card and all my marketing materials and even go door knocking with that as a tool. Lead Capture. At the top of every page is a LIKE button. When I press that it disappears. In effect, what I just did was give this page permission to publish commercial content to my stream. And when I comment on anything from that page to let my friends know. What happens to that button after I push it? Is it replaced by an UNLIKE button? Nope. There’s a very small link on the left side column but you have to search hard to find it. That’s Lead Capture! The Landing Tab. I saved the best for last because it’s the most important. 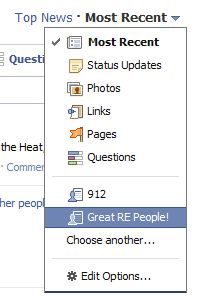 Pages can direct all new people who have not LIKEd the page or are not signed in to FB to any of their tabs. That could be the Wall, Info or a purpose built tab designed to convert visitors to LIKES. Here’s the thought: Whatever you did to get me to visit your page; marketing, ads, door knocking, or just good conversation… it’s all wasted if I don’t press the LIKE button. Harsh but true… If your Page sends new people to the Wall without asking them to LIKE you are wasting a bunch of your time. Want to learn how to create a custom Facebook Page that attracts, engages, and converts “Fans” into customers? 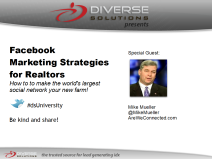 View this 60-minute webinar with Facebook Marketing Expert Mike Mueller from AreWeConnected.com. Thanks for sharing this post. Mike is one of the best and sure will check out his webinar. Thanks Chris, courtesy of Mike of course. Thanks Mike. I’ve been meaning to set up my lists ever since your first post on the privacy issue. Thanks for tuning in Mark, this webinar with Mike was a blast and we look forward to having him again!